Home >> Why don’t people in small towns walk or bike anymore? I grew up in a small city of 15,000 people and it was just natural to walk or bike anywhere I wanted to go – nothing was far away and it was an enjoyable way to get around. Fast forward a couple decades and what we see today is lower rates of walking and biking in smaller towns and higher rates in big cities – especially in the urban core. It would be a mistake to say it’s simply a generational shift or to assume British Columbians who’ve chosen small town living care less about active travel. From public opinion polling we did earlier this year, we know that support for walking and biking facilities is as high and sometimes higher in Northern BC and other areas outside Metro Vancouver. So what’s the problem? In many ways it should be easier to walk and bike in small communities, because…they’re smaller! (and presumably shops and services, workplaces and schools should be relatively close by and traffic should be lighter). Over the last generation in urban centres there has been a movement in community planning to encourage density – which results in people living within walking distance of shops and services; as well as transit expansion and the incremental building of cycling networks. However, the local governments of smaller communities often are limited by a smaller tax base which gives them fewer resources both in terms of their budget and staffing. The cost of building is a barrier but also for land acquisition and planning. It’s not uncommon for smaller towns to not have a planner with active transportation expertise or even have a full-time planner of any type. Once upon a time, there wasn’t even a good set of guidelines for planning pedestrian and cycling facilities in smaller communities. Thankfully, some smart people have put together resources such as the Small Town and Rural Multimodal Networks Guide and Putting Smart Growth to Work in Rural Communities. Certainly there are many great examples in BC that demonstrate what can be done in small towns. Squamish and Whistler both have great off road trails that allow people to walk and bike between community and shopping centres. Gibsons has recently put in an ‘advisory lane’ which is common in small towns in the Netherlands and shows how a town can create a safe bike lane where there are few cars even if the roadway is narrow. 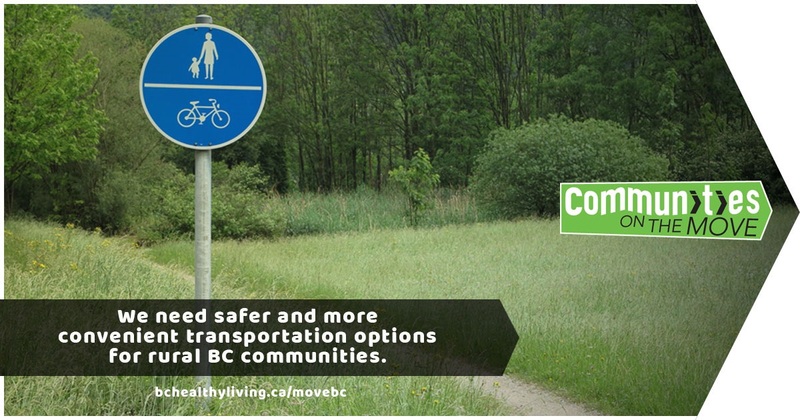 In every corner of the Province, from Campbell River to Invermere to Smithers, citizens are calling for more walking and bike routes for tourism, for recreation and to get around safely. What can you do? Tell the Minister of Transportation and your MLA that you want more funding available so that your local government can build more paths and on-street facilities – so you can be more active! Find your MLA here. Participate in the BC Government Budget Consultation.